Okay, so maybe "spacious" is a strong word. But it feels a lot bigger than 300 square feet, if I do say so myself. In trading square footage for location, I was faced with the task of making this tiny studio feel like home. And with a mix of plants (that I've managed to keep alive), strategically placed mirrors, and hidden elements, I think I've accomplished my goal. The studio came packed with lots of space-saving features so I can't take all the credit. The bottom half of the vintage shelving unit pulls out into a bed and there's tons of storage throughout. But my love for clothes (and the resulting bursting closet) necessitated a little TLC in order for this tiny space to work. I furnished the place with comfort and navigability in mind. I created a "living room" area with a vintage patterned rug and a small love seat. The rug helps to section off the space and the small sofa is perfect for two (or three if personal space isn't your thing). I added a gallery wall above the sofa to establish the area as the focal point of the apartment. I put a dining room/office area on the opposite wall using a desk/table hybrid. The bench seating allows for multiple people without having to move the table away from the wall. I used the second bench seat that came with the table as a shelf for plants and bags. 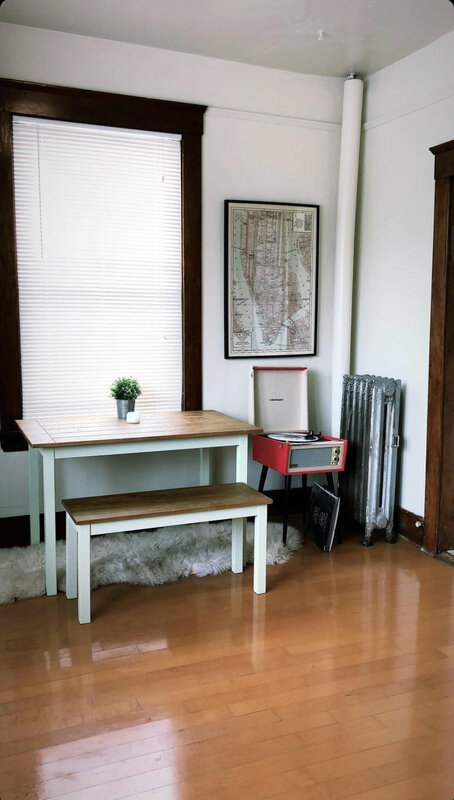 Next to the table, I have my record player and a large framed map of New York in the corner. In one corner, I gave myself ample clothing storage by adding a clothing rack and topping it with cute vintage baskets and hat boxes. In another corner, I have a small wooden chest of drawers that I've had in my room since I was a baby. I use this as a sort of getting-ready station with hot tools, makeup, and a large mirror. On the other side of the room, I have a giant floor mirror that gives the illusion of extra space and assists me with my mirror selfie efforts. I framed this corner with plants so the mirror would reflect them and make the space feel a tad jungle-esque. Stepping up to the challenge of making this tiny space feel not only livable, but homey, was a bit intimidating. But after living here for a few months, I can confidently say my mission has been accomplished. Stay tuned for a tour via Instagram stories (@theeverywear).